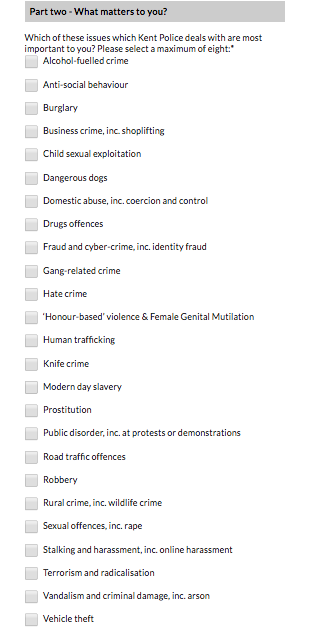 My attention has just been drawn to an annual survey by the Kent Police and Crime Commissioner. Part 2 asks about the issues with which Kent Police deals and which are most important to residents of that county. Respondents are asked to select a maximum of eight priorities from a long list. There is no 'Other' category. Here is a screen shot of the list. It is shocking to see that Safeguarding and Protecting Children and Young People does not appear on the list. The nearest category is 'Child Sexual Exploitation' - which is just one part of child abuse and neglect. Because there is no ‘other’ category the results of the survey are bound to show that Safeguarding and Protecting Children and Young People is not a priority for the people of Kent. I think that is a disgrace. Does this, I wonder, reflect Kent Police's priorities? Are children and young people such low priorities that they don't even feature for inclusion on a list of possible priorities? Clearly nobody in the Police and Crime Commissioner’s office thought to include them.